It’s Valentine’s …. time again, and while I am not so gung-ho about it when it comes to the grown-up part of it (Lloyd and I do not do anything special, and that’s how I like it), I do love, love, love the heart-making part of it with little kids. It’s a cheery thing to do in the dull grey of winter, and when you teach preschoolers the steps of: fold, crease, trace (a half-heart pattern), and cut (along with the very, very important admonition of ‘You are going to goof up the first couple you make, and that’s ok! Everybody does and we are just practicing.’), the look on their faces when they make their first one is priceless. This year we we added a new skill to the mix. The week before last was National Lutheran Schools Week and we made some hearts and water drops by stapling paper strips. As I looked at the hearts, I remembered the quilling that was all the rage back in the 70’s. (Am I remembering that right?) Whenever it was, the deal was that you rolled strips of paper up and glued them onto a backing to make incredibly cool patters. 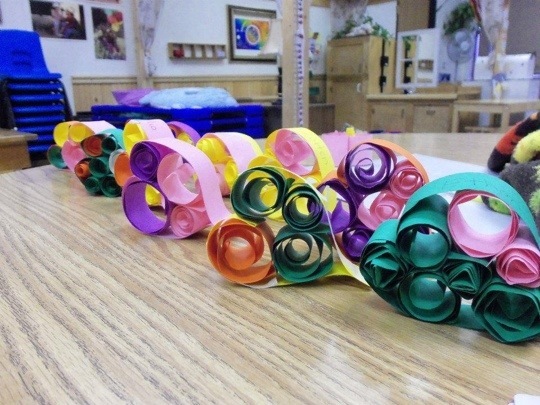 Something like that is a wee bit challenging for the preschool set, but rolling up strips and putting them into hearts? Can do. There. Something pretty for a Sunday. When I was a kid, I had a snowflake on black velvet that was made with curled up pieces of paper. I was fascinated by it. I remember studying it for long periods of time. I would press on the curls and pinch them and feel the velvet. I wonder if I still have that snowflake somewhere. Your hearts are lovely! Really. And I don’t remember quilling. But speaking of things from days long ago, I was just talking the other day with a friend about Color Forms. I LOVED those as a kid! So easily pleased back then. My Aunt gave my a quilling book this summer when she came to visit. It has beautiful designs in it that the instructions make sound quite easy. I’m not convinced that’s true. I haven’t tied it yet, but I have looked at the book several times just to marvel over the things I could make if I tried!